We just love these tiffany blue and pink colors together for a birthday cupcake dress/outfit. We designed this dress at the request of a customer who was having a beach birthday party centered around these colors. So sweet, soft and elegant. 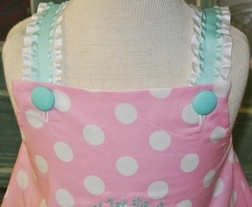 The dress/top is made with pink with white dots fabric and is trimmed with tiffany blue ribbon on top of white ribbon. If you choose shorts, capris or pants, they are made with the same fabric and trims. 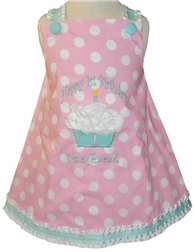 The front of the dress/top is appliqued and embellished with a cupcake with one candle. The most gorgeous tiffany blue and white tulle/rusched fabric flowers form the icing. The bottom of the cupcake is made with the tiffany blue fabric. You may choose the number to be embroidered on the cupcake. Purchase the matching birthday hat for the complete outfit.